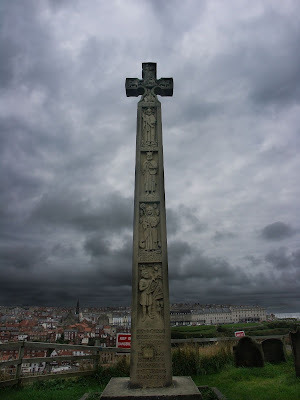 This impressive modern stone cross in Whitby, England, commemorates the creation of the earliest recorded poem in English, now usually called ‘Cædmon’s Hymn’. I won’t go into the story in detail here (although it’s fascinating in itself), but I do want to emphasise that Cædmon was not, as is sometimes claimed, the first English poet, nor was his ‘Hymn’ the first English poem. The very story of Cædmon, as told by Bede in the 8th century (at least half a century after the event), indicates that poetic composition in English was well established, but also that it was wholly oral; and that Cædmon himself, a layman employed by the monastery at Whitby to take care of the cows, was illiterate and had to have Bible stories read or paraphrased to him before he could turn them into English poetry. Cædmon’s Hymn, a fragment of what was presumably a more extensive poetic corpus, was preserved not because it was the beginning of English poetry, but as a marginal note to the Latin text of Bede’s Historia ecclesiastica gentis anglorum. The Journey, by Fenwick Lawson. Image (cc) Kaihsu Tai. More on St Cuthbert: in recent news, it has been reported that a sculpture (called The Journey, by Fenwick Lawson) of monks carrying the coffin of St Cuthbert of Lindisfarne may be relocated from Millennium Place in Durham to a spot outside Durham Cathedral. A BBC news article quotes the trustees of the sculpture as saying that not enough people see the piece of art in its current location, but the Sunderland Echo provides a less dignified reason, the fear that the statue might become a target for drunks. In any case, the move is oddly appropriate, since the statue commemorates the move of the actual body of Cuthbert from Lindisfarne, where he died and was buried, to Durham. The monastic community at Lindisfarne, where Cuthbert was bishop until his death in 687, repeatedly raided and threatened by Vikings from 793 onwards, relocated inland: first to Chester-le-Street (near Durham), then to Ripon, then finally to Durham in 995. The monks took with them the coffin in which Cuthbert’s body and his relics were preserved. "In the multilingual world of medieval England, translation was a ubiquitous and important form of information transfer." For the commun at understand. In the multilingual world of medieval England, translation was a ubiquitous and important form of information transfer. But the meaning of ‘translation’ was broader in the Middle Ages than it is now; linguistic translation, like the translation of a saint, was a transfer of what was meaningful or valuable, not necessarily a correspondence of the textual elements in one language with the textual elements in another. An extraordinarily high number of medieval English texts are acts of translation. At one end of our time period, the earliest surviving extensive English texts are Latin-English glosses; at the other end, in the fifteenth century, many of the earliest books printed in England were William Caxton’s translations of French texts – a cloth merchant’s importation of fashionable literary goods from the Continent. J. D. Burnley, ‘Late Medieval Translation: Types and Reflections,’ The Medieval Translator: The Theory and Practice of Translation in the Middle Ages (Cambridge: D. S. Brewer, 1989) 37-53. Bruce R. O’Brien, Reversing Babel: Translation among the English during an Age of Conquests, c. 800 to c. 1200 (Newark: U of Delaware P, 2011), especially 45-51. Thanks to Lisa Vargo for the tip about the proposed translation of The Journey.